Heads Up®, is not a traditional fungicide, and therefore the product has no fungal/bacterial inhibiting properties. Instead, Heads Up® utilizes a unique Mode of Action (M.O.A), called Systemic Acquired Resistance, or S.A.R., where the product when applied as a seed treatment, activates the plants own genetic resistance to diseases by stimulating the plants natural defense pathways before disease sets in. Heads Up® offers growers full season, systemic control as it is a signalling plant activator. Heads Up® contains no living organisms, and is compatible with many inoculants, fungicides or insecticide seed treatments.. Heads Up can be easily and safely mixed with other fungicides/insecticides or liquid inoculants, or used on its own for seedling and soil borne disease prevention. 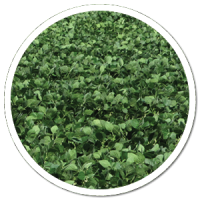 Fifteen plus year of studies have show, Heads Up® is very effective when mixed with other fungicide/insecticide/inoculants used on your farm and can offer extra insurance to the grower because of its separate, novel M.O.A. Check with your local dealer / distributor if self treating and unsure. To see our Heads Up® brochure, click here.